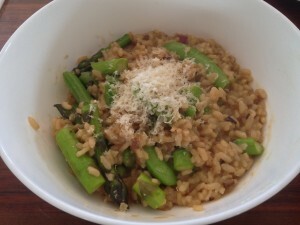 Spring vegetables always make me want to eat risotto. The garden is full of sugar snap peas and I’ve just got a beautiful bunch of asparagus that is begging to be used immediately while it is snappingly fresh. Risotto has always been a difficult dish and I’m not sure I know why. It was always the dish-of-death on Masterchef and so it is for me. Too gluggy, overcooked, undercooked, more like a pilaf than a risotto. If there is a risotto sin to be committed, I’ve done it. But it shouldn’t have to be like that. And I don’t give up easily. I approached making this with some skepticism. I figured that the flavour and texture of risotto is hugely dependent on butter and cheese and it was one dish I’d have to let go. I took some inspiration from a recipe on Herbivoracious which uses no butter at all. It uses olive oil and some soft cheese and lemon juice and parmesan at the end. I substituted the Botanical Cuisine Lemon and Dill cashew cheese for the soft cheese and lemon and grated some Vegusto Piquant over the top at the end. It isn’t very pretty in the picture – the brown colour comes from the fact that I included some dried porcini and charred the onions slightly too much. But the flavour and texture is all there. The rice is still has an ever so slight bite, and there is a slightly soupy texture there too. Put the stock on the stove to simmer. Add the oil to the pan and fry the onion until soft. Don't let it brown. Add the rice and fry until the oil coats all the grains and it starts to toast ever so slightly. Stir in the porcini mushrooms and the white wine. Add the stock a ladleful at a time. Stirring after each addition. The risotto should never stop simmering so don't think you can cheat and add cold stock. You don't need to stir non stop, but you should stir frequently as this is what gives the creaminess to the risotto. Cook the vegetables separately, I just blanch mine in some hot water and then refresh them in cold so they are bright green and beautiful. You can do them in the same pan with the risotto, but timing is critical. I find doing them separately saves any grief with overcooking the rice. Taste the risotto regualrly. You are looking for a fairly wet consistency where the rice grain just has the tiniest amount of bite to it. You have a very small window for error here. If you think it is almost ready it will overcook while you are thinking about it. Turn off the heat. Add some water or stock to thin it out if it needs it. Stir through the cashew cheese and add the vegetables. Serve with some vegusto grated over the top. It is important that the stock is not salty. It reduces as it cooks and you'll end up with something too salty to eat. Taste as you go and if you find it is getting salty then add water instead of stock. It is easy to add salt at the end, but impossible to remove it! Any spring vegetables would be good here, shelled broad beans, tiny artichokes, peas, asparagus - whatever you have on hand. Risotto is loveliest when the sweet spring flavours shine. I actually prefer it without cheese, tho I’d find relinquishing butter very difficult.It all comes down to the stock for me. Have you tried with a dusting of mint thyme and parsley with your lemon? Not a lot of ‘cheese’ in it Chris, but the creaminess of the cashew “cheese” gives the liquid that buttery mouthfeel.